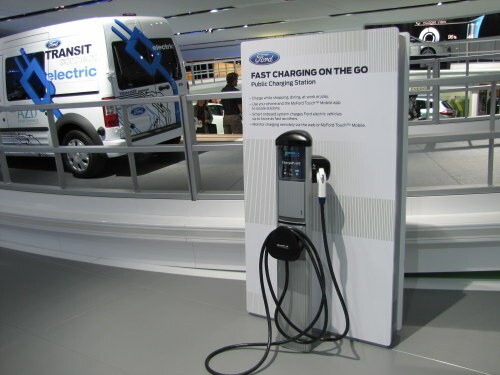 The Ford Transit Connect Electric shown at the 2011 NAIAS is not to be outdone by Ford’s latest Transit Connect entry into natural-gas powered vehicles. Ford Transit Connect Taxis will begin winding through the streets of Chicago, the Windy City, in March when a fleet of the alternative-fuel vehicles joins Yellow Cab Chicago. According to a recent Ford Media release, Taxi Medallion Management purchased 12 clean-burning compressed natural gas (CNG) Transit Connect Taxis for its fleet. The cabs will be affiliated with Yellow Cab Chicago and bear the company’s logo and color. The purchase is part of the company’s goal of reducing emissions by 25 percent, said Michael Levine, CEO of Taxi Medallion Management. According to the U.S. Environmental Protection Agency, CNG is less expensive and burns cleaner than gasoline, resulting in 30 to 40 percent less greenhouse gas emissions. Since introduced as a production vehicle last year, Transit Connect Taxi is gaining interest from taxi operators around the country. The first taxi was delivered to Boston Cab Dispatch in December 2010. For the record, the standard Ford Transit Connect won the 2010 North American Truck of the Year, featuring a 2.0-liter I-4 engine that gets EPA-estimated 21 mpg city and 26 mpg highway, an estimated 30 percent improvement in fuel economy compared with traditional taxis. In addition to CNG, Transit Connect Taxi is available with an engine preparation package for conversion to liquefied propane gas (LPG). Both CNG and LPG lower taxi fleets’ operating costs are lower as America is now the leader in nat-gas supplies, and which is better for the environment. During its first full year of production, 27,405 Transit Connect vehicles were sold in the United States. According to Ford, demand for Transit Connect continues to grow as evidenced by the 41 percent year-over-year increase in sales for December 2010. In addition, several organizations with large fleets purchased Transit Connects including Best Buy, Edible Arrangements, ThyssenKrupp Elevator and DTE Energy. T. Boone Pickens would be so proud!